The global heparin market is anticipated to attract growth opportunities on the back of the rising count of surgical procedures and increasing treatment of venous thromboembolism (VTE) including pulmonary embolism (PE) and deep vein thrombosis (DVT). Anticoagulant heparin holds the ability to reduce blood clotting. It could be used in blood transfusion, blood samplings during prophylaxis treatment, and the treatment of blood clotting disorders. As per the analysis of the report, the global heparin market could expand at a CAGR of 6.2% for the forecast period 2017–2025 to reach a valuation of US$16.3 bn by the end of 2025. In 2017, the market attained a valuation of US$10.1 bn. As studied by the analysts, the world heparin market could be segmented on the basis of product, source, and formulation. By product, the market is predicted to encompass three segments, viz. unfractionated heparin (UFH), low molecular weight heparin (LMWH) and ultra-low molecular weight heparin (ULMWH). Amongst these products, LMWH had accounted for a king’s share in the recent past and is a widely used heparin to this date. Generic and biosimilar drug manufacturers are expected to be empowered with growth opportunities birthing from the patent expiration of a majority of LMWHs. Since LMWH does not cross the placenta, it has been recommended as one of the most appropriate forms of heparin to be used during pregnancy by the Royal College of Obstetrics and Gynecology (RCOG) and National Institute for Health and Care Excellence (NICE). However, ULMWH is still used as a more novel therapeutic among the products in the heparin family. As per a segmentation by source, the world heparin market is prognosticated to be classified into bovine and porcine. After its ban in the U.S. and Europe in the 90’s, bovine-sourced heparin had been proposed by the Center for Drug Evaluation and Research (CDER) to be reintroduced in the U.S. By formulation, the market could be divided into oral and parenteral. 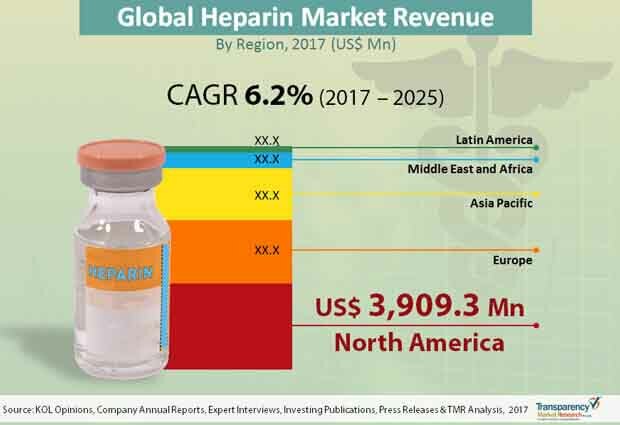 In terms of regional segmentation, the international heparin market is envisaged to witness the dominance of North America followed by Europe in the coming years. By the completion of the forecast timeframe, North America could be leading the market with a US$6.0 bn secured under its belt. An estimate one-third of the DVT/PE patients in the U.S. could have a recurrence within 10 years and nearly half of them could develop long-term complications. Increasing incidences of coagulation disorders and burgeoning geriatric population are prophesied to help the Europe market to achieve a handsome growth in the near future. Not to forget, Asia Pacific could be a faster growing region of the international heparin market rising at a 7.6% CAGR due to its largely untapped nature. The probability of PE in India, according to the National Institute of Health Consensus, is close to a 20.0%, whereas the overall incidence of DVT after elective hip surgery is approximately a 45.0% to 70.0%. The Middle East and Africa and Latin America are foreseen to tread upon the heels of Asia Pacific. Some of the prominent companies operating in the worldwide heparin market could include Dr. Reddy’s Laboratories Ltd., Teva Pharmaceutical Industries Ltd., Fresenius SE & Co. KGaA, Sanofi, Pfizer, Inc., LEO Pharma A/S, Aspen, Baxter International Inc., B. Braun Melsungen AG, and Syntex S.A.
Key applications of heparin include prevention of blood clotting during dialysis, treatment of pulmonary embolism and deep vein thrombosis, and unwanted blood clotting during open-heart surgery. Heparin is the foremost clinical anticoagulant with more than 500 million doses consumed globally each year. Heparin and related molecules exhibit a large number of newly discovered biological activities with optimum therapeutic potential. Advantages of heparin such as immediate onset of action, short half-life, simple laboratory monitoring, ability to be reversed (protamine), and low cost have led to its broad use. A detailed overview of market dynamics, including the drivers, restraints, and opportunities of the heparin market, along with porter’s analysis, major brand analysis, and market strategies adopted by top players of the global heparin market, has been provided in this report. Market revenue as well as volume analysis for all the above mentioned segments has been provided for the forecast period of 2017-2025, considering 2016 as the base year, and 2015 as the historical year, along with compound annual growth rate (CAGR %), for the forecast period of 2017-2025. Market share estimations were based on in-depth analysis and study of products, and their features etc. This report provides in-depth analysis value and volume of the heparin market. The stakeholders for this report include companies involved in the manufacturing of heparin. Executive summary section is included snapshot on stakeholders in this report, which summarizes the market size, trends and competition in different regions. Market players and market share analysis is analyzed to signify percentage share of the major players operating in the heparin market. Furthermore, the report includes market analysis by geography that depicts the most attractive and significant region in the global market in 2016. On the basis of product type global heparin market is segmented into unfractionated heparin (UFH), low-molecular weight heparin (LMWH), and ultra-low molecular weight heparin (ULMWH). On the basis of source heparin market is segmented into bovine and porcine. On the basis of formulation global heparin market is segmented into oral, and parenteral. Based on geography, the global heparin market is segmented into North America, Europe, Asia Pacific, Latin America, and Middle East and Africa. The report also consists of in-depth analysis for Muslim and Non-Muslim countries; Muslim countries such as GCC Countries, Morocco, Tunisia, Egypt, Turkey, Indonesia, Malaysia and Non-Muslim countries such as U.S., Canada, Germany, U.K., France, Italy, Spain, South Africa, China, India, Japan, Australia, Israel, Brazil, Mexico, Argentina, heparin market for products and source. The report also comprises list of major players in the market, their SWOT analysis, market share of these players in the heparin market, key business strategies, product portfolios, and recent developments. Key market players profiled in this report include Dr. Reddy’s Laboratories Ltd., Teva Pharmaceutical Industries Ltd., Fresenius SE & Co. KGaA, Sanofi, Pfizer, Inc., LEO Pharma A/S, Aspen, Baxter International Inc., B. Braun Melsungen AG, and Syntex S.A.